Scott Elmquist Rappahannock is one of the busy spots anchoring what’s becoming the new restaurant row on East Grace Street. The once-bustling shopping district along East Grace Street had fallen off most people's radars when chef Jason Alley decided to do for East Grace what he'd done for Broad Street — namely, convince avid foodies it was a worthy dining destination. 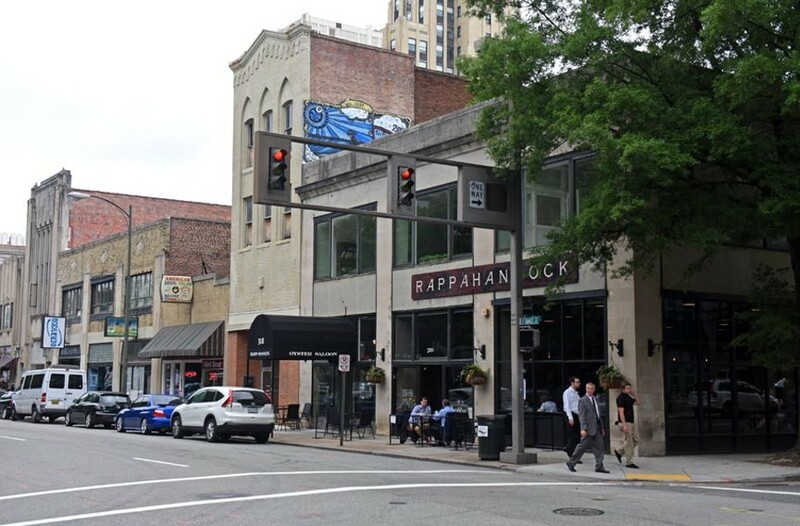 Like a cheerleader, he sang the street's praises, convincing no less than the Rappahannock Oyster Co.'s Ryan and Travis Croxton that their first Richmond restaurant, Rappahannock, belonged there as well. Before too long, Julep's New Southern Cuisine, Lucca Enoteca Pizzeria, Pop's Market on Grace, Rapp Session and even Greenleaf's Pool Room, right around the corner on Sixth Street, joined the party to lure eaters to this stretch of Grace — and not only on nights when there's a show at the Dominion Arts Center. Soon the North Carolina chain Secret Sandwich Society will join them, and Eat Restaurant Partners — owners of Foo Dog, Fat Dragon and Boulevard Burger and Brews — will open Wong Gonzalez, an Asian-Mexican fusion joint. Bonus: Grace Street now runs two ways through the area, a boon for suburbanites who find one-way streets the bane of their city-going forays.